Ruchi Aggarwal is a Marketing and Strategy professional with over 2 decades of multi-industry, cross cultural experience. She has been based both in India and the UK, and has had a track record of success and innovation. She has worked with interesting and diverse industry sectors – Sports@Scottish Rugby, Edinburgh; Telecom Services@Vodafone, India; Healthcare@Bausch and until recently, IT@Microsoft, in India. She currently lectures at the Business School at the University of Lincoln, UK and additionally takes on a few Independent Consulting assignments. There’s more to her. Ruchi is a successful Industry speaker – both internationally and in India. She speaks on a wide range of topics – Strategy and Business, Marketing, Diversity and Inclusion and Personal Branding. Her special interest is in the development of talent in Women and she has been invited across the world to speak on how women can break through and succeed. 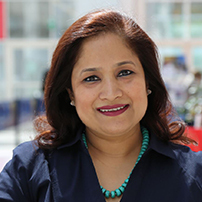 Ruchi was a key member of the Diversity and Inclusion Council at Microsoft and was Microsoft India’s representative to the Anita Borg Institute that hosts the renowned Grace Hopper event for Women in IT. In her current role as lecturer and Independent consultant, Ruchi brings together her experience, the ability to connect with an audience and the joy of nurturing young minds.